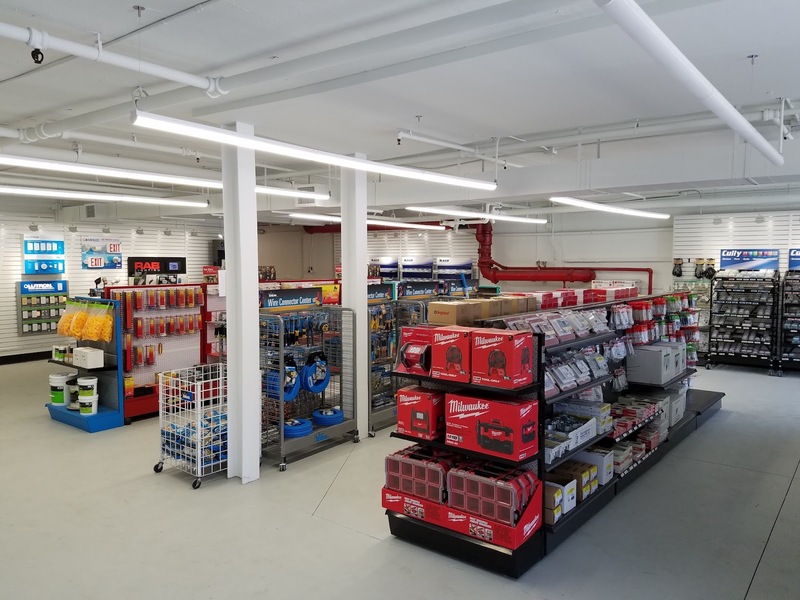 The Counter Sales showroom is the "first impression" of our company. 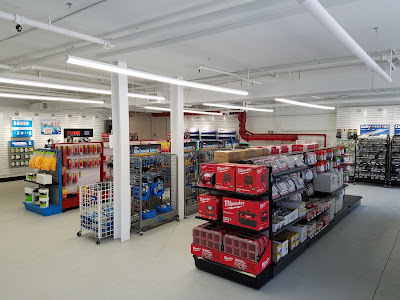 It is a heavy traffic area for customers placing Will Call orders, for visiting product representatives, and acts as a showcase for the various product lines that we carry. We needed this area to be bright, inviting, and illuminating. We chose the Fluxstream LED Linear fixtures by Philips Daybrite for its sleek design, smooth diffused light, and dimming capabilities. 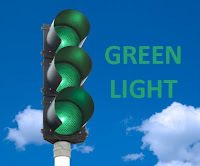 The Fluxstream LED fixtures are fully dimmable using a 0-10 volt control signal. With a cross section of roughly 2” x 2”, the Fluxstream gives the appearance of a “rod of light” suspended from the ceiling. Each 8ft section consumes 82 watts and delivers 7800 lumens of 4000K high color rendering light. The new fixtures replaced worn out two lamp 8ft slimline industrial strips consuming 135 watts each. The light levels increased dramatically and vertical illumination increased, making product more visible and labels easier to read. To further enhance the space, we added Lutron 0-10V wireless controls to include local dimming control, occupancy sensing and daylight harvesting. See the dramatic before and after below. LED, Juno LED track, new slat wall, epoxy floor, and fresh paint. reds, yellows of product packaging. 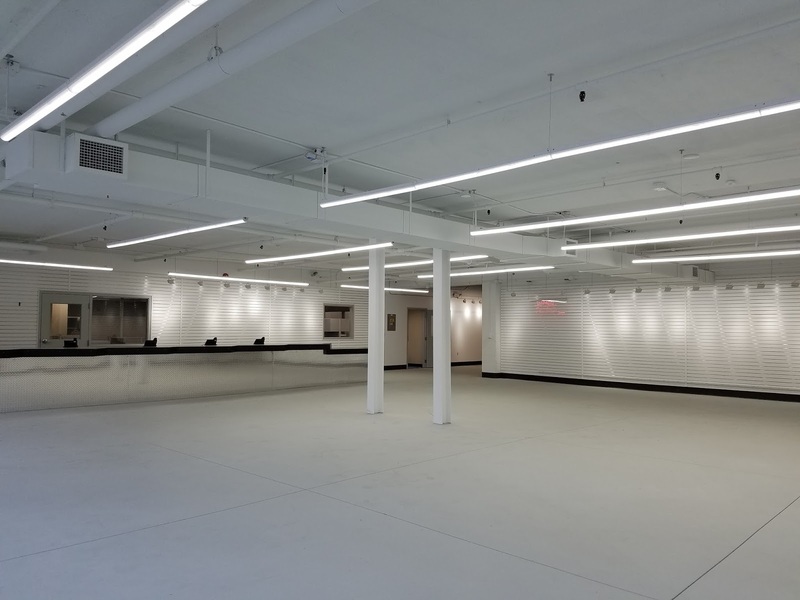 When we purchased our new Corporate Headquarters building in January 2016, we immediately noted the areas that needed a lighting upgrade to better suit our needs. 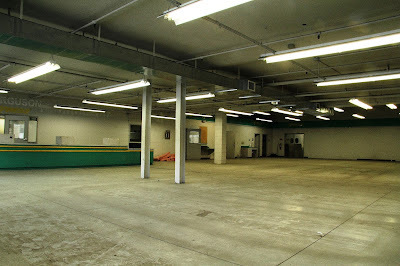 One of the first priorities was the Warehouse. 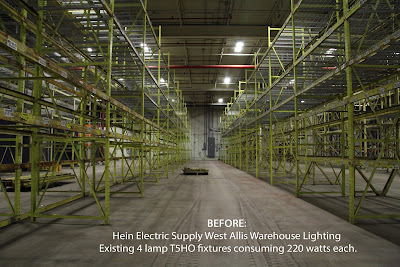 The existing Warehouse had approximately (100) 4-Lamp T5 HO fixtures illuminating the aisles, the receiving area, and the shipping areas at 220 Watts per fixture. 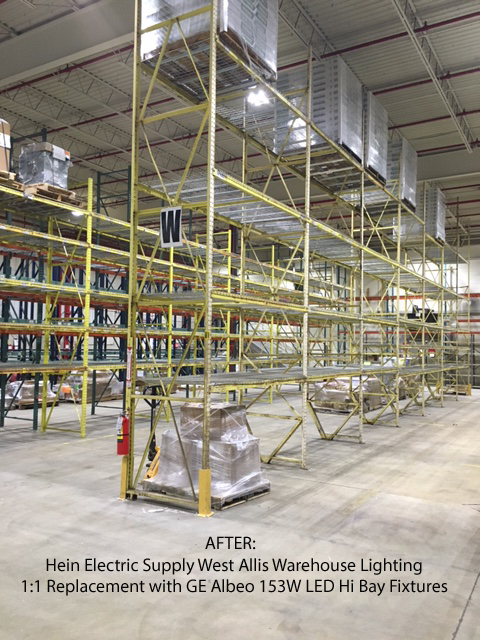 Thanks to our partners at GE Lighting, we were able to replace the existing T5HO fixtures with new GE ALBEO LED Hi Bays. 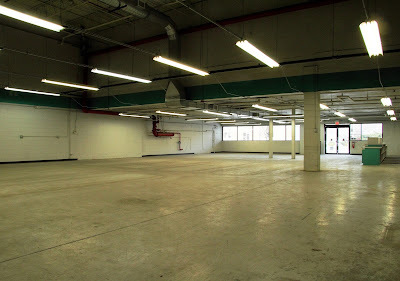 For the general warehouse, we installed (96) GE Albeo, 17,200 lumen fixtures at 153 watts each. For the Shipping and Receiving areas, we installed (4) GE Albeo 24,160 lumen fixtures at 190 watts each. 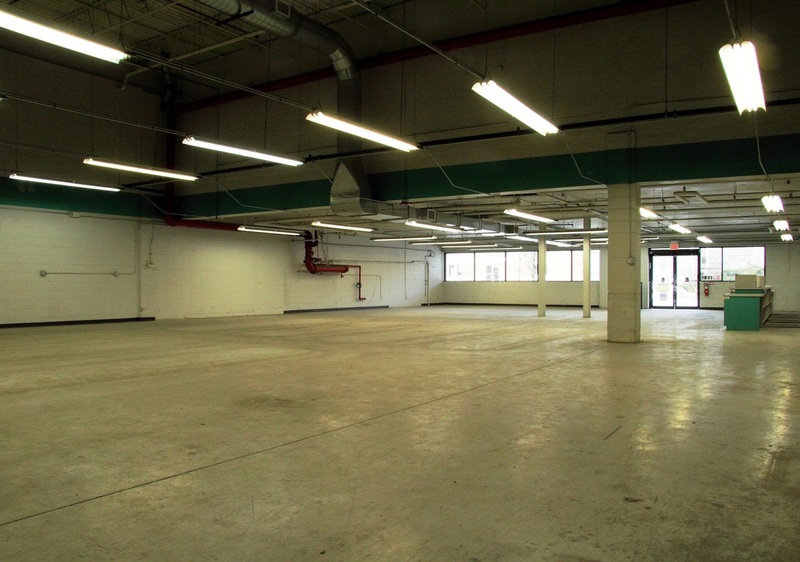 We opted to increase the light level in lieu of maximizing our energy savings. 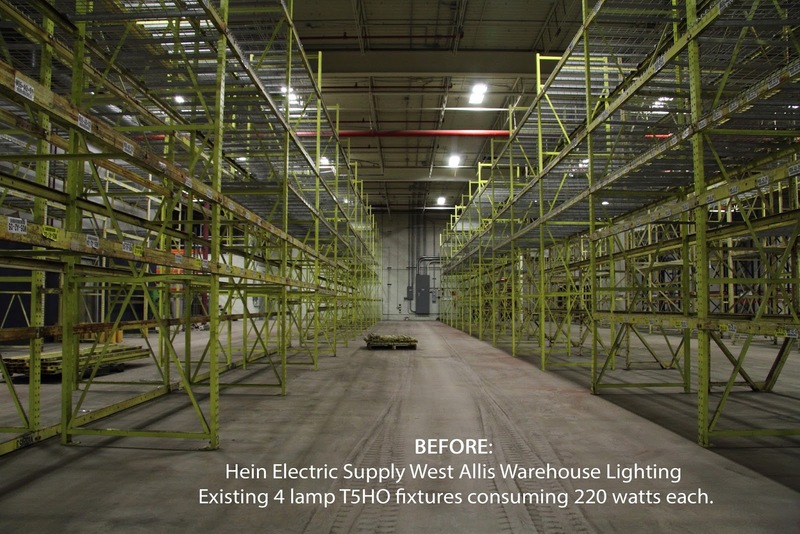 GE offers an Albeo 12,000 lumen, 95 watt fixture package, but we decided that a greater lumen output was a better option for our space. The result is clarity of the box labels, better visibility to pull product, and a safer working environment.